For today’s tourists, a smartphone is the ultimate travel companion. This handy device provides guidebooks, navigation or booking services all in one place. Apart from being useful for travelers, mobile devices are also a powerful touchpoint for the travel industry which can use it to sell its accommodation, restaurants or cruise services. Low-quality networks, or even a lack of internet connection, can negatively affect both sides. It doesn’t have to be a problem anymore. Progressive web apps can solve this. Let’s take a look at 10 companies which have benefited from PWAs. Progressive web apps are modern web pages which also perform as mobile apps. Although this solution is still quite new on the market, it is already trusted. The implementation of this solution in the travel industry, and not only, can improve mobile page speed and user experience. What’s also great about PWA technology is that it works offline. There’s a short guide on progressive web apps here. Just imagine a hotel booking or car rental webpage which is visited by the user to select a room or car. In the case of a standard web page, the user could access booking information only with full access to the internet or by installing an additional mobile app. With progressive web apps, the whole process is much shorter and simpler, as the booking information will be kept in the browser and the user can access it even without connectivity. If it’s more convenient for users, they can also save a PWA web page on their home screen and use it as a mobile app. According to research carried out by Hubspot, in answer to the question “How many airline apps do you currently have installed on your smartphone” approximately 40% of users answered that none, and 25%, that one. As a result, 65% of users don’t use any application or use only one. Since not many users download applications, this may be a signal that it is the time to opt out of them. Progressive web apps can be used on sites operating locally like Barcelona, which is a map of popular attractions, national ones like Jumia Travel operating in Africa, as well as those with a global reach, such as Airbnb or Wego. PWAs can be simple like Ride, which is a multi-city bike share app showing you real-time information about the bike share scheme in your city, or be extended like Trivago. No matter where your eCommerce works, all you need is an idea and a PWA to create something that will interest your customers. The City Council of Barcelona is the highest administrative body of the municipality of Barcelona in Spain. The City Council of Barcelona wanted to indicate the most interesting points of the city for both tourists and inhabitants. They wanted to concentrate on communication through mobile devices. Therefore, the city council decided to make a mobile application available in combination with Barcelona’s Digital City Plan. The choice fell on progressive web apps. It was a good choice because a PWA has all the advantages of a native application. Who does not want this? All the advantages of the native app without bothering to build one. Coolcousin.com is a travel portal which allows you to explore interesting city spots and cool activities. Cool Cousin will provide you with personalized and up-to-date information that will ensure you an unforgettable experience. Cool cousin wanted to increase page load time and its conversion rate. Jumia Travel is an online travel website providing hotel reservations across Africa. The company was founded in 2013 by the eCommerce platform Jumia (the former Africa Internet Group). The website is available in English, French and other African languages (Yoruba, Ibo, Hausa and Swahili). After successful implementation of a PWA by Jumia, the company decided to implement this solution also in Jumia Travel. In sub-Saharan Africa (Jumia Travel’s main market), more than half of the mobile connections are on 2G networks. Most users use lower-end phones and have internet connectivity issues. That is why it was so important to find a solution that would allow for an optimal experience. Make My Trip is a pioneer of India’s online travel industry. Founded in 2000, the company wanted to make traveling easier and smarter. Makemytrip.com helps you with all travel aspects, like hotel reservation, flight bookings or car rentals. Makemytrip.com decided to invest in a PWA implementation to improve mobile users experience (most of the mobile users use an unstable internet connection). Delivering a progressive web app has had impressive results. Ola is a leader on the Indian market of cab aggregators. The company operates in over 100 cities in India and employs around 600,000 drivers. The company was established as a startup and quickly transformed into one of the largest taxi companies in southern Asia. They have over 300 million daily taxi trips. A mobile app was supposed to help users and employees with daily usage. Users there struggle with intermittent cellular connectivity and have low-end smartphones with low memory and slow processors. Ola decided to build a mobile application. A PWA was selected. It was the best solution to their problem. Redbus is one of India’s largest bus ticketing platform companies. The company has undergone a transformation from a local company to an international carrier. The company was founded in 2006 as a part of online travel company MakeMyTrip. Now, the company serves over 8 million customers each year. Redbus wanted to expand the company and its services, so they decided to make a progressive web app. Tajawal is a company that operates in the UAE, and beyond. They offer cheap flights over 450 airlines and over 1 million hotels worldwide, and also complete package solutions. With Tajawal, travelers can easily find an affordable flight to the destination of their journey or a nice place to sleep. The PWA makes the use of Tajawal even better. Access in offline mode, the ability to add to the home screen or a quick front are just a few advantages. Treebo Hotels is an Indian budget hotel chain and hospitality service. The company was founded in 2015 by Sidharth Gupta, Rahul Chaudhary, and Kadam Jeet Jain. Treebo operates using a franchising model, and at this moment has over 350 hotels in 80 cities in India. Treebo was struggling with users abandoning the site. Over 53% of users resigned from browsing the site after just 3 seconds. The company wanted to change this and increase their page load time. The idea for Trivago appeared in 2005 in Düsseldorf, Germany. A year later the site was launched. The site is available on 45 international platforms. With over 80 million users visiting Trivago’s websites per month the company is a world leading hotel search engine. Most Trivago users use mobile devices more often than desktops, and fewer and fewer users use native apps. Therefore, Trivago decided to implement a PWA, which perfectly suited their needs. Founded in 2005, Wego is one of the most known travel search websites and mobile apps in the Asia and Middle East regions. The site allows its users to compare all travel products and prices in the marketplaces. Wego lets you find the best offer. The company decided to use progressive web apps after they realized that their websites load in about 12 seconds. A significant number of users abandoned the site after 3 seconds. In this way, Wego lost a lot. They wanted to change it with a PWA solution. less than 1 sec web page load instead of 12 sec. 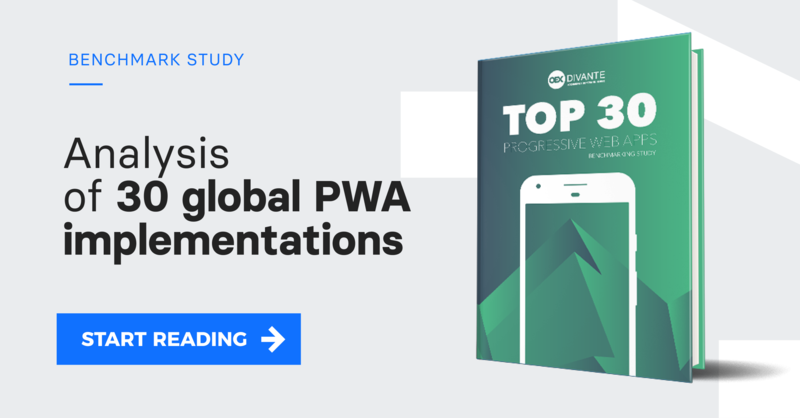 How can you add PWA to your business? As you can see, progressive web apps have a lot of potential. PWAs do not have to be limited to only one industry. If you’re still wondering about a PWA solution for your eCommerce, you should run an estimation or test it out with a proof of concept which takes just a few days.